Written for architects, engineers, and preservation professionals, this is the only comprehensive book to examine how the International Building Code and the International Existing Building Code (IEBC) can be applied to historic buildings. For ease of use, the book is organized to parallel the IEBC itself. 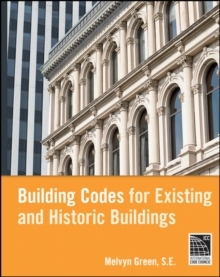 It discusses code history and the reasoning behind specific regulations, and how codes are applied to existing buildings, along with issues such as occupancy and use, type of construction, safety, and energy conservation. No building professional should be without this handy guide.